Greek misanthropes Burial hordes return with eight new hymns of demonic devastation over 40 minutes. It’s been six years since the bands last full length, and there have been some changes in the bands core sound. 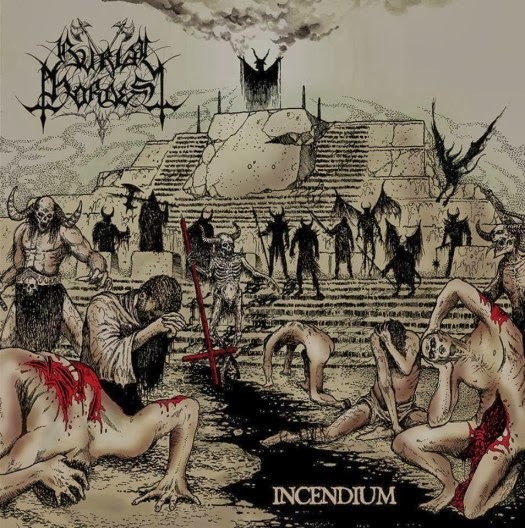 While it still remains clearly rooted in the black metal realm, Incendium incorporates many more death metal elements than on previous works. This is most noticeable in the vocals of Cthonos. Bearing little resemblance to the more traditional second wave screeching commonly associated with black metal, Cthonos instead opts for a relentless roar. Sometimes coming off as a slightly less processed Demigod era Nergal at certain points. Don’t get me wrong, Burial Hordes always had a bit of deathly influence in their vocal attack, but this album moves them further into the death metal territory, with only the occasional more feral black metal sound being used to highlight specific sections. The vocals are also very prominent in the mix, which increases the barbaric brutality of their assault. The production and mixing are another significant change in the bands overall sound. While previous albums had a much more primitive sounding production, which fit those albums really well, then new one is much cleaner. Unlike many modern bands however, Burial Hordes has managed to keep a dark and deranged feeling in the music. While the production is improved, it has not sucked the life out of the bands music. Instead it highlights the bands new more death-orientated approach, and the fact that they have improved technically as both musicians and songwriters. There are some searing riffs and even brilliant subtle bass runs incorporated in songs like "Scorned (Aokigahara)", which nods to the dissonant melodies of the current French black metal scene. It’s a quality blend of Greek mysticism, Polish barbaric blackened death metal, and French dissonance. I must admit that as a long time Burial Hordes fan, the first listen threw me for a bit of loop. While I hadn't listened to earlier records in quite a while, I really was expecting a much more traditionally second wave influenced black metal record. Listening back to the older records, I realized that these deathly elements were always present, just not pulled to the front as they are this time around. Subsequent listens have led to me to appreciate the new approach the band takes. 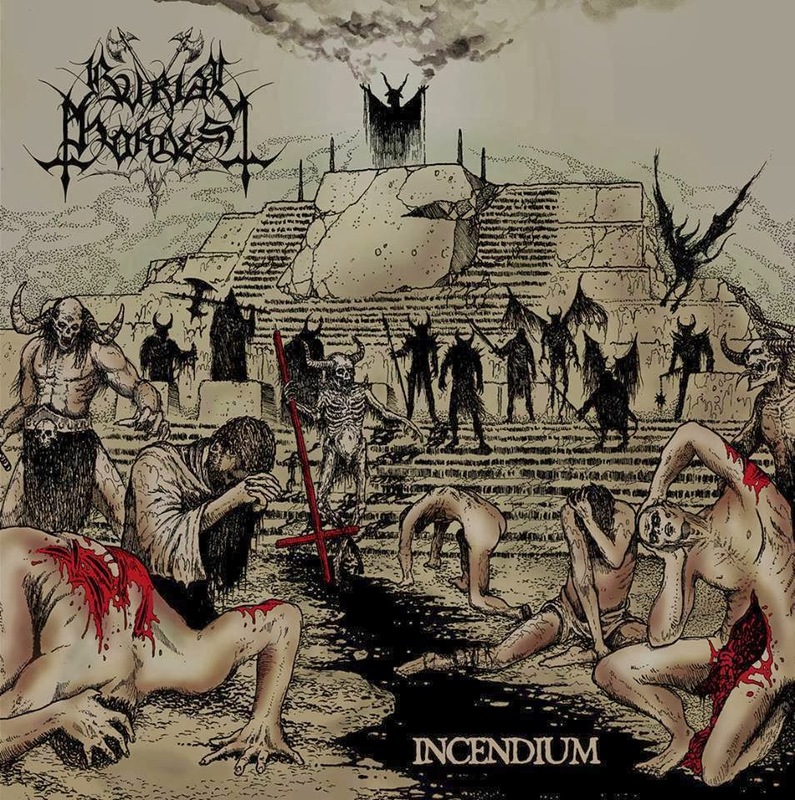 This is overall, one hell of a demonic slab of blackened death metal. Burial Hordes does a great job of keeping this album from becoming a one-dimensional sonic bludgeoning. While the album starts out with a couple of blistering, relentless slabs of bone crushing black death, later songs play with pacing and an increased use of melody and atmosphere. There are enough quality riffs and nuanced songwriting to be able to differentiate different tracks, while keeping the overall vibe and mood consistent. Overall, this is worth a listen for anyone who has been a fan of Burial Hordes in the past or anyone who appreciates a masterful blending of black metal and death metal.